When in Barcelona, I would definitely stay here again. The staff is very helpful and friendly. My bed was comfortable. I felt safe. The location is within walking distance of various sights and there is easy access to the metro. The 24 hour available free breakfast was complete with a variety of selections and very satisfying. Evenings featured cool get-to-togethers. After 35 Hostels I have found the best one ever! The Staff was excellent, Jessica was exceptional, but all other was awesome! The 24 hour breakfast with Fresh Eggs for your cooking was outstanding! The nighly activity with Sangria and Paella was the best and it was Free! The Traditional Food night for 5 Euro a must do! The Chep outstanding a needs to be Commended! Stay at this Hostel, Outstanding and Helpful! There map is detailed and eat place is wonderful Thanks Hostel Team, a job well done! One of the best hostels I’ve ever stayed at. Top three for sure. You absolutely will not regret staying here. Wonderful! 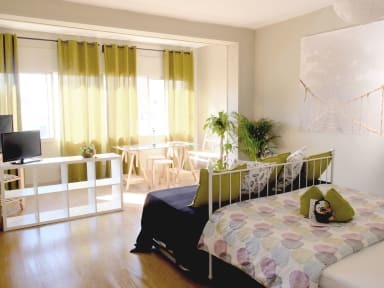 Good location, as two blocks from metro allows easy access to all of Barcelona. Clean, private, and cute - an absolutely charming building. The staff were welcoming, and between free breakfast, cheap water, and free paella, the hostel was very satisfying. I'm psychotic about cleanliness, and seeing the bathrooms being cleaned every day was comforting. The only thing is it's a bit of a walk from the waterfront/old-town, but for the great budget price, I'd definitely stay here again. Great location, very friendly and helpful staff. Absolutely recommendable. Great little hostel! In the city centre, can walk to most things you want to see. The staff are amazing, very helpful and fun. The free breakfast 24/7 was such a perk, having that really sets you up for the day. The rooms were spotless, as were the bathrooms. Probably not enough bathrooms for people, so at peak time a bit of a wait, but overall would 100% recommend and come back! This is truly the best hostel at which I've stayed! The entire staff was open and friendly, and it was obvious that they wanted to make sure that everyone got the most out of their stay in Barcelona. The atmosphere in the hostel was also great. The common spaces were open, and it was easy to get to know other travelers. I was also there for their weekly Saturday free paella dinner- amazing! All of the facilities were clean too, and the 24/7 free "breakfast" station was a plus. Very friendly and welcoming staff. Social atmosphere. Facilities were kept clean and well stocked. Beautiful terrace overlooking an old water tower and park. Would 100% recommend. My only negative was the camera in my room. It was pointed at our lockers and not the sleeping area, and was meant as part of the security, but it was still jarring to have that inside a room.